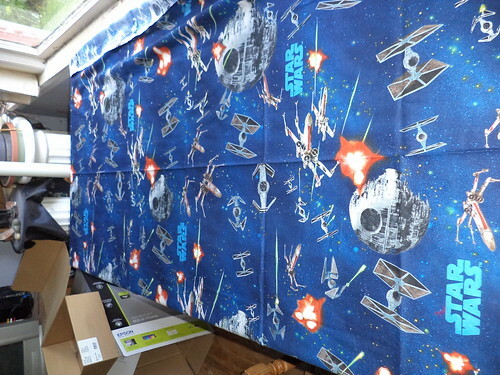 Back in July, all full of excitement and energy, I purchased a bunch of cloth which is destined to be curtains for various windows in Carole's house. 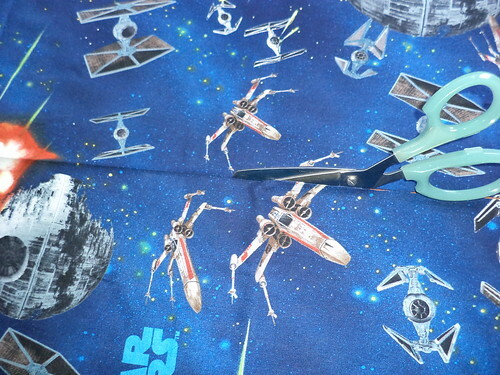 Minus the Hawkeye fabric, there are four hunks here waiting to be turned into curtains. It was going to be a fun and easy project to do. One set one day and move on to the next one. Then August arrived and my energy left. The past weekend was perfect. The highs were in the mid 70's with clear blue skies. After sitting on the deck for a half hour, I felt more energy than I've felt in at least 6 weeks and I grabbed the top fabric off the pile. 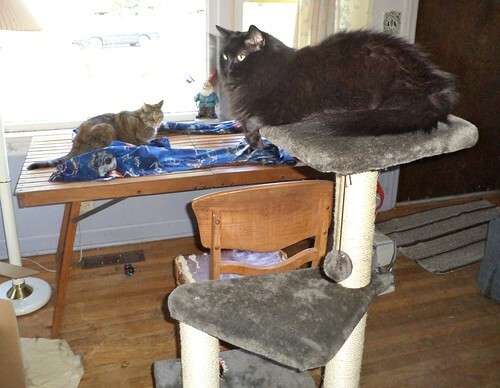 I had, over Labor Day weekend, moved the pile from the office to the living room table. That was a major step towards getting these done. The "out of sight, out of mind" idea is very much a part of my life here. If I hadn't moved them, it would be October 20th with my leaving 3 days away and I'd not have them even started. 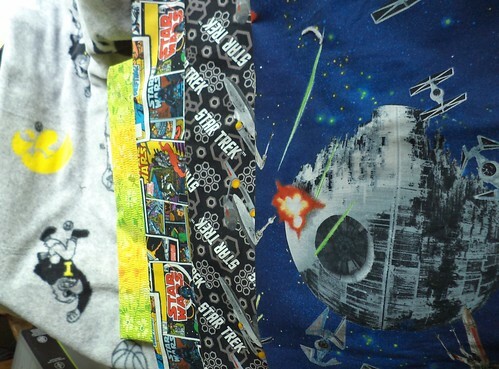 So, I grabbed the top fabric, the one with the Death Star on it. I unfolded it across the table. You know, that would make a great tablecloth. Years and years ago, I remember a tutorial on turning a piece of plain cotton into a water resistant table cloth for picnics. It wouldn't be water proof, just stain resistant of the temporarily wipe off junior's mashed bananas-type of fabric. But these are going to be curtains. The windows are of sufficient width that a piece 44 inches wide can be cut in half and I'll have plenty of overlap to cover the window. So, I cut it in half. 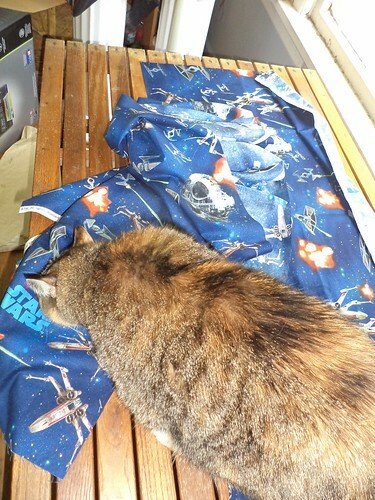 Step 2 is to negotiate which section of fabric I can have and which section Mija can lie on. 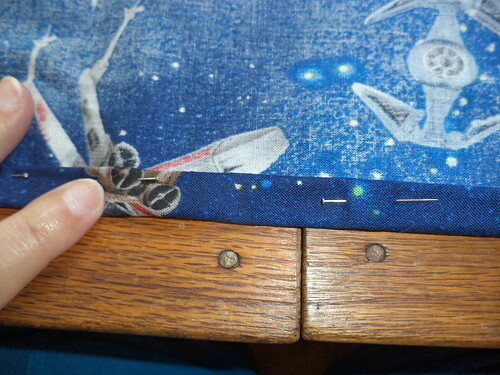 When that was done, I started measuring for the side seams. 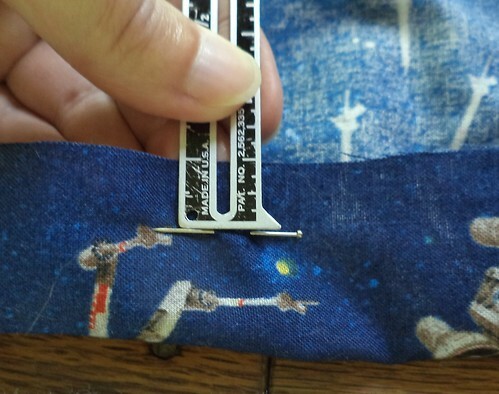 I measured a half inch and pinned. 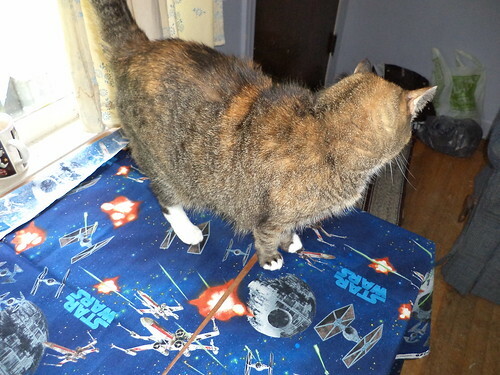 Then, I folded over again for a half inch, total seam. On the other side, I just folded in the selvage edge and pinned. Since it's a finished edge I don't need to fold it twice to keep it from unraveling. That's as far as I got yesterday. I moved the sewing machine from the office to the living room. It's just a matter of stitching the seams and the sides are done. Then I can move on to pinning the top for the casing and hemming the bottom. It may seem like not much but this fatigue can best me even when I think I feel great. Once I get one done, I know I'll feel energized to do more, maybe make a couple in one day. While I was pinning, I heard a noise behind me. I got up to refresh the hot water in my mug and someone was on the top of the cat tree. This is a first. She's never gotten up there on her own. They both just wanted to be near me. Simple projects are a great way to ease yourself back into things.